I’ve had my eye on the Elsa Murano for some time now. Basically, I think all the Pandora Disney Muranos are beautiful! 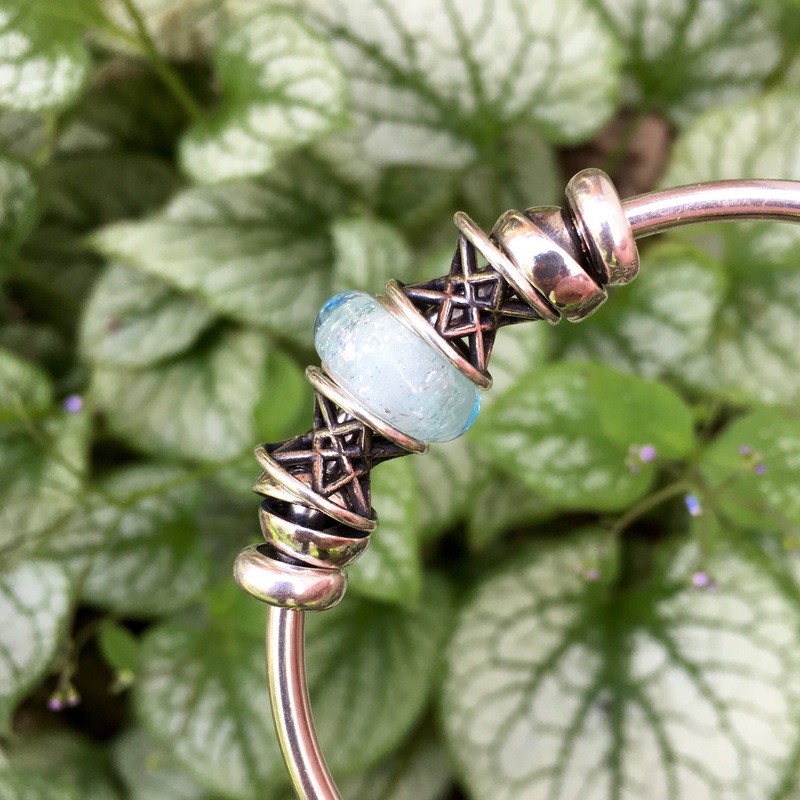 This one is a cold, crisp pale blue and especially beautiful surrounded by silver. 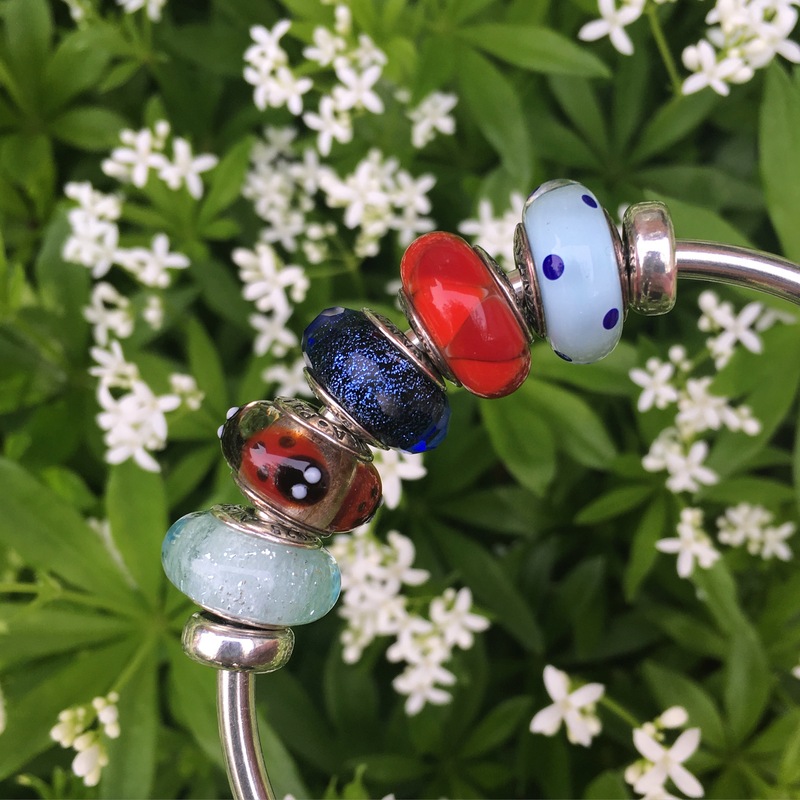 This is a Trollbeads bangle with two Neverending beads and two Smile of Stars. 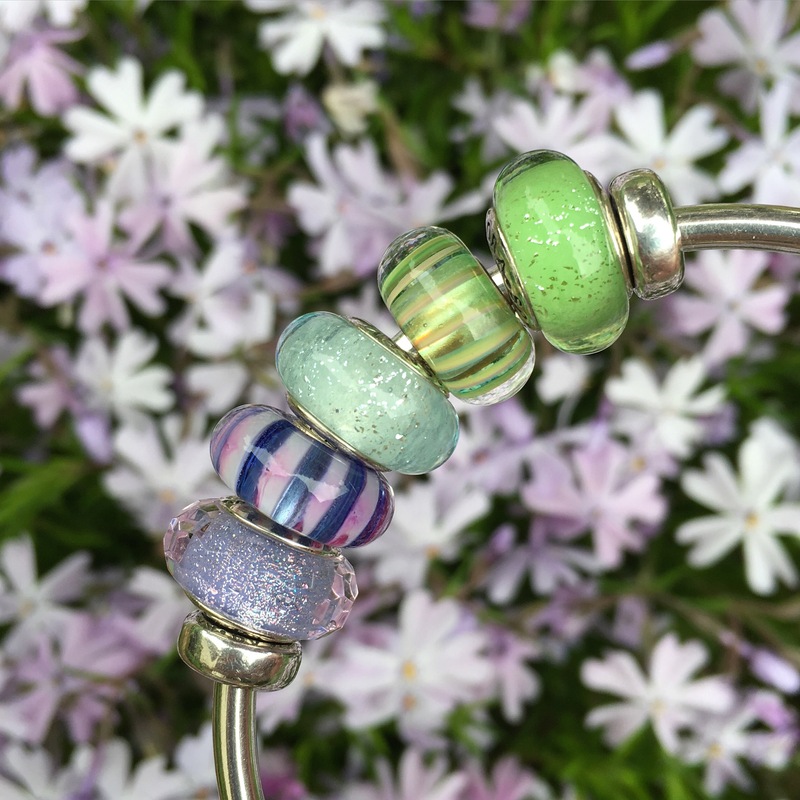 Next up is a bangle with the Pandora Purple Shimmer, Trollbeads Violet Stripe, the Elsa bead, Trollbeads Wise Bamboo and Pandora Disney Tinkerbell Murano. 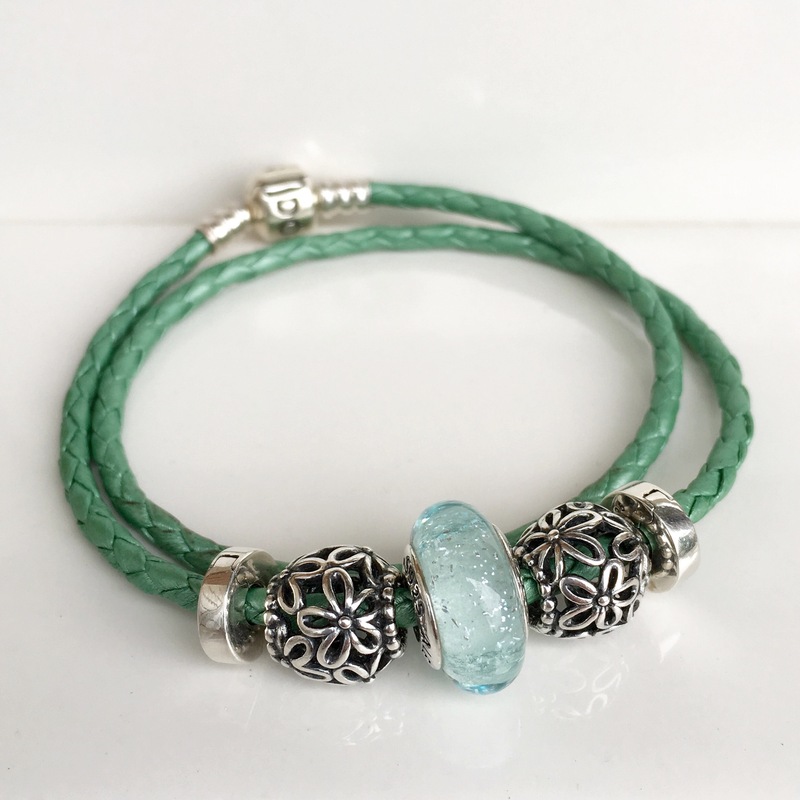 I also like the Elsa bead on a sweet and simple Pandora green leather bracelet, with two Wildflower Walk silver beads held together by the Ohm Beads Bare Clips. 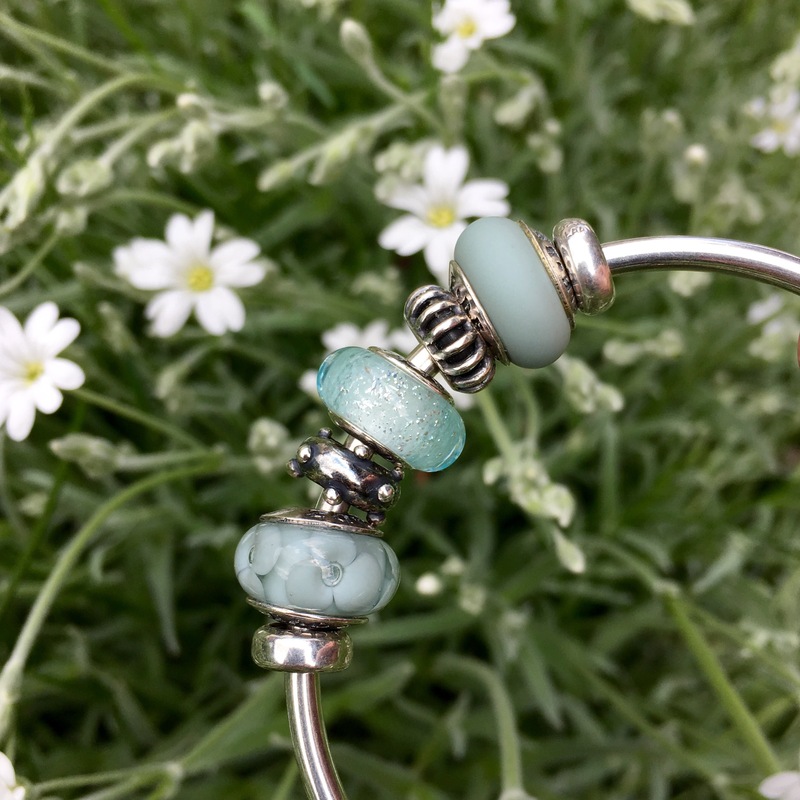 Here is the Elsa bead combined with a couple of True Beadz in the Blue Mist shade and the Sunbeam and Dot’n’Dot Trollbeads spacers. Finally, here are some older Pandora beads with the Elsa bead and in the middle is the newer Blue Fascinating Iridescence. These shimmery beads are just so beautiful but very difficult to photograph! I can hardly wait to see the Frosty Mint and Teal ones from the summer collection! 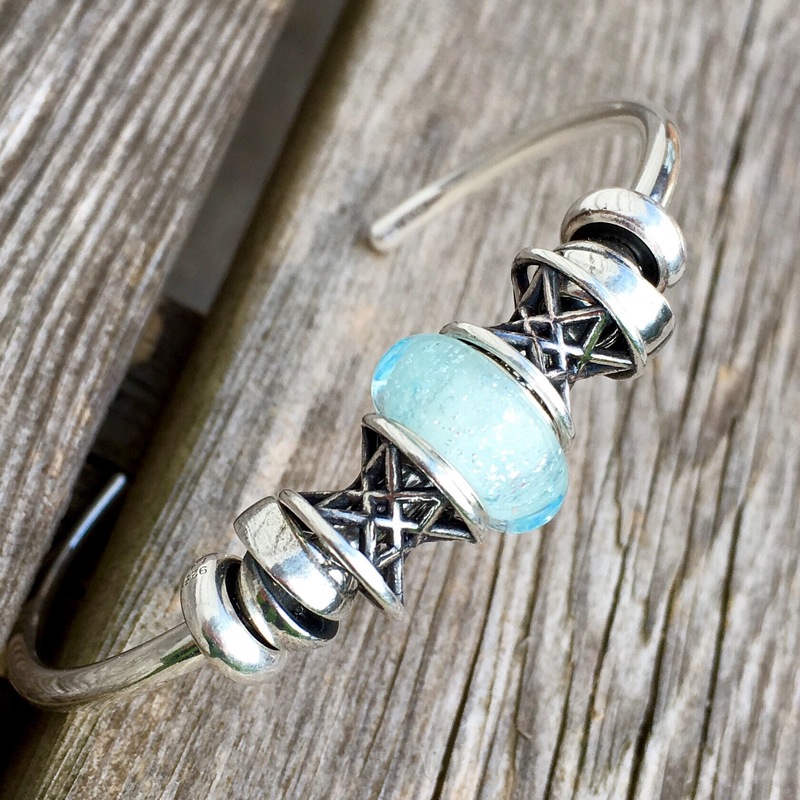 There is always great information over on Mora Pandora if you want to see more of the upcoming Pandora summer collection! Does anyone have any Pandora purchases planned? Thanks! So glad I bought that green leather last year! It’s nice to see some of the older Pandora Muranos, like the ladybug in the last photo, which has the perfect balance of colours and beads. The ladybugs were so pretty in all the different colours. My favourite photo and combination here is the Trollbeads bangle with the mix of Pandora shimmers with the Troll stripes. It’s lovely. I wish I could put that on and wear it every day! I quite like the older Pandora bangle, too! But I’ve always loved red and light blue together, not sure why. It makes me think of the seaside for some reason. I’m glad you like the bangle with the Troll stripes. I was pleasantly surprised with how it looked! Thanks very much! It’s such a pretty colour and the shimmer is so nice! I absolutely LOVE the Disney Muranos. Ooo…will look forward to seeing your photos of that!